I meant to write about this back in September, but I’m somewhat delayed by life getting in the way of Pengoing South; the perils of keeping a blog! This year marked the 50th anniversary of what has become known as ‘Operation Condor’ but is not to be confused with its mainland South American namesake. What few people realise is that, through the mid to late 20th century, the British government could be argued to have been pursuing a policy of ‘setting loose’ the Falkland Islands and sending some clear messages that the Islands should be looking to their neighbours for more of their needs. The older members of the community here remember this period and the interesting series of events that went along with it in none-too-favourable terms but it has often been conveniently forgotten by history in the wake of 1982. In this atmosphere of British nonchalance, political confusion, renewed Argentine interest and early commercial air travel, the people of Stanley found the 28th September 1966 to be an unusual day. For many, the sound and sight they were witness to that day would have been the first occurrence of such a spectacle. Unbeknownst to them, earlier that day 19 men and one woman from a right-wing nationalist group called Condor boarded a flight from Buenos Aires to Rio Gallegos,along with a photographer and, in a strange coincidence, the head of the local government for Argentine Patagonia (which included their claim to the Islands). Thirty minutes after take-off, the group of ‘steel workers’ stood up and revealed that they were armed and consequently hijacked the airliner. Some argue this was the very first armed hijacking of a commercial airline but there is some debate over that. 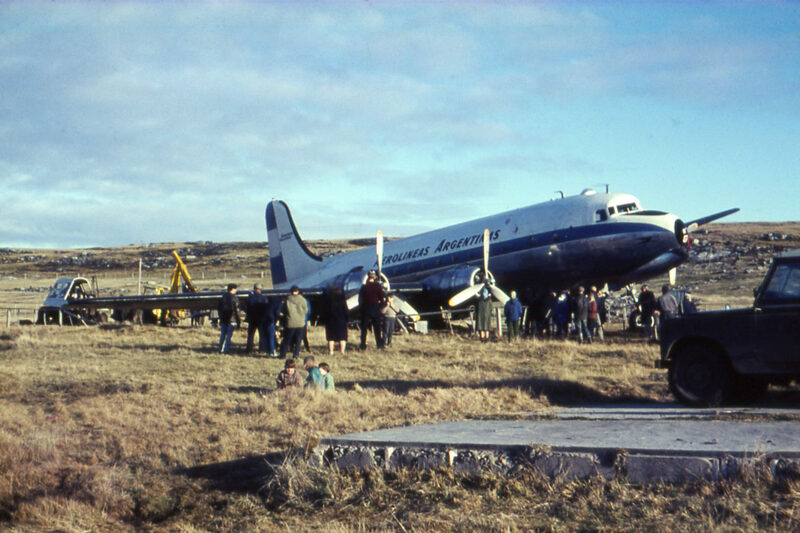 The cool-headed pilots were ordered to alter course and make their way to the Falkland Islands and promptly did so with some concern given their knowledge that the Islands possessed no runway that could handle a DC4. Upon arrival, the pilot did as instructed and, with what must have been a large amount of skill and nervousness, landed the DC4 on the flattest grass area on the Islands: Stanley Racecourse. There it promptly bogged itself into the ground and the assailants hopped out to pursue their ‘invasion’ of the Islands. Assuming the plane was in some distress (for what other reason could there be for a DC4 to fly so low over islands with no airport? ), locals quickly flocked to the plane to offer what help they could. Among the first on the scene was the Police Sergeant who was quickly taken hostage with a few others and so began a potentially disastrous but fascinating notch in Stanley’s history books. The local Royal Marines (who I believe numbered 6) were quickly mustered along with the volunteers of the Falkland Islands Defence Force and, later, all suitable adults including a quite bewildered new teacher to the Islands who soon found a gun in his hand for the first time in his life (his excellent account of it can be found here). The Catholic priest, a Father Roel, began a series of negotiations with the hijackers and, having run out of food and water, the passengers were soon let go (one account I’ve read states that the police sergeant had already snuck away by that point by hiding under the priest’s gown as he left – the mental image of this going on in the middle of a hostage situation makes me smile). The hijackers then spent a tense night in the plane surrounded by an armed perimeter and, with no heating or food, were soon defeated by the Falklands’ weather. They gave themselves up to Father Roel and were escorted, not to the prison or police station but to the annex of St Mary’s Church. Keen to avoid a diplomatic nightmare in an already tense atmosphere, the hijackers were transferred to a ship sent from Argentina and returned to their homeland. They received a heroes’ welcome and only a few were ever brought to trial, serving nominal sentences of a few months. The DC4 was eventually stripped of any excess weight, fitting and fixtures (seats and all), de-bogged with no small effort and the very same pilot bravely re-used the racecourse as a runway despite his and others’ reservations about the possibility of doing so. So ended this blip in international relations . Or did it? As a side note: two years later, their leader decided to crash land a small Cessna plane into Stanley during a visit by Lord Chalfont (who was in the Islands to reassure the population as to the UK government’s intentions). Once again, he was returned to Argentina diplomatically (on the same boat as Lord Chalfont) and the plane was dismantled and shipped away. A few years following this, he was killed by the Argentine government. 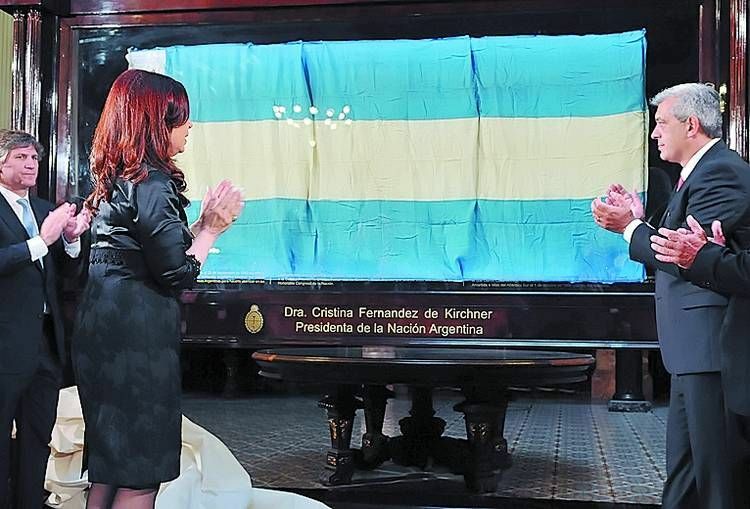 Come the 21st century, the renewed extreme obsession over the Argentine claim saw Cristina de Kirchner unveil the flag planted by the hijackers in a media-frenzied ceremony in the Argentine Congress and later award generous state pensions to the ‘heroes’ involved in the ‘invasion’ despite the fact they carried out an armed, illegal hijacking. And people wonder why tension still exists. One of the statements you hear surprisingly often from people who are leaving the Falkland Islands is that “it’s not the real World, is it?”. It’s a bizarre statement but it’s one that, when you dig a little deeper, you can make some sense of. The lack of crime, the albeit unintentional sense of isolationism, the infrastructure consisting of so many limitations, the local newspaper (the inimitable Penguin News) reporting the issues of c.2800 people and the all round quaintness of the Islands can all make for a wonderful community to live in if you appreciate it. For some, it can be too much. You observe the advances going on in others’ lives through their projected image online and see the issues affecting them and can end up feeling left behind. Today? Today, this doesn’t feel like such a bad thing. If being disconnected with what’s happening in the Northern hemisphere isn’t living in the ‘real World’, then that has to be OK in the current political climate.